The Expo West often called The Natural Food Show, was everything I had expected this year. Yearly, I look forward to George Vutetakis dropping by for a visit. He works on both coasts, so when he’s in town we try and see each other and catch up on all the food news. The size of the show is the largest yet, as many new and old companies, speakers, non-profit organizations and authors gathered to show their products, speak on health , and support their cause. It’s so nice to have an old friend stop by and release you of your duties for a few minutes and discuss the best of the show exhibits and just say hello. You can find George at local farmer’s markets signing his book, The Vegetarian Guy. Many of his recipes are excellent original ethnic dishes you can incorporate into your diet. 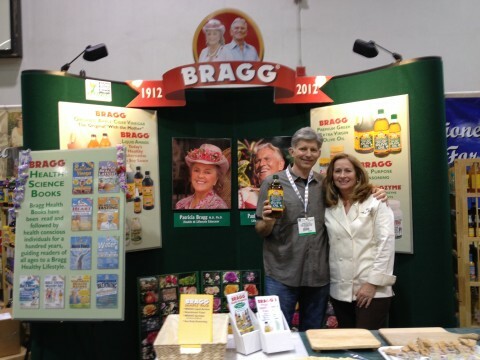 This is George Vutetakis, a wonderful friend who captured a fun moment in the Bragg Booth. George has created the blog, called The Vegetarian Guy. He travels developing products, teaching, and cooking for many with his lovely book The Vegetarian Traditions. Check his blog for upcoming events and where you might be able to sneak a few minutes with this amazing chef and blogger.